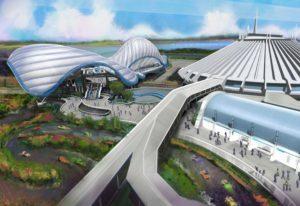 The incredibly popular Tron Coaster from Shanghai will be added to Tomorrowland in the Magic Kingdom. This attraction will be built on an unused expansion pad, just outside the railroad track, directly beside Space Mountain. It will be located behind the Tomorrowland Speedway. The attraction takes guests on a ride through the Grid on their own light cycle. The coaster’s track takes riders inside and outside the attraction’s building, reaching speeds over 60 miles per hour, the fastest for any Disney roller coaster.